Love the yarn, love the project. 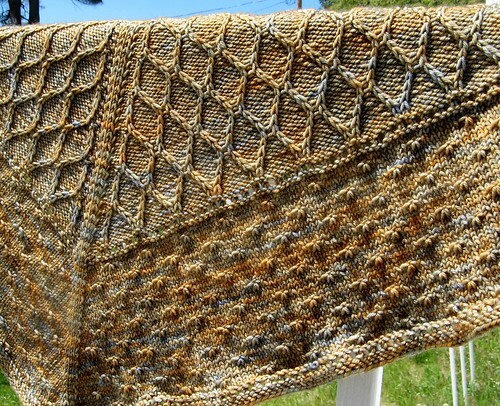 I did extra repeats of the lower border to use up as much yarn as possible. I found both stitch patterns intuitive and fun. My only complaint is that the garter stitch lower edge seems to flare a bit on my shawl … maybe more strenuous blocking is in order? 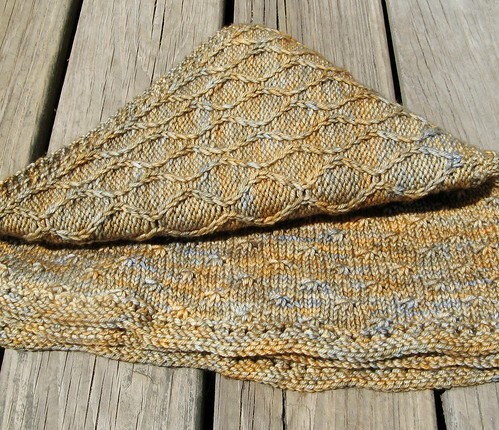 I like the silver-gold look of the yarn. A gilded look. Very attractive and warm looking. I don’t know how the good people at Mad Tosh do it … all I know is they achieve the most gorgeous colors! That’s an attractive colour combination and I love the stitches. 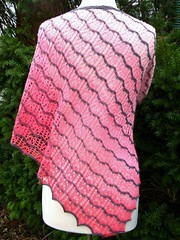 What a great looking shawl. Lovely combo of colour and textures.